These small electric heaters are safe and low cost. The best space heater is a personal heater. Warm the Space - anywhere you sit with Cozy Legs radiant Heating Panel. Mount it to your desk or wall or use the optional stand for full, safe portability. Flat panel provides low cost safe heat. 9 lbs. Size: 22.5" x 16" x 1" 150 Watts, 0.9 amps, Approximate surface temperature 145 degrees F. ETL listed 3059941 (UL2021). Buy Cozy Legs in a 4-Pack and Save. We recomend the optional Hi-Lo switches and Cozy Leg Stands (see below). Stand holds Cozy Legs heating panel in vertical position. Make placement easy. Great for the shop floor. The worst place in the plant, and you have to spend the day there. FootWarmer insulated rubber heating mat to the rescue.6 lbs. Size: 20.5" x 13.75" x 0.25" 90 Watts, 0.8 amps Approximate surface temperature 135 degrees F. ETL Listed. NOTE: These heaters are very warm and are not for pets or elderly who may have reduced temperature awareness. It is recommended that the FootWarmer be used with the Hi-Lo Switch (below) to provide a lower setting and a way to turn the Footwarmer without unplugging. 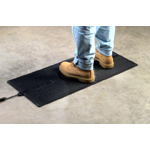 The rubber FootWarmer mat is to be used with caution in an office or home environment because some of the mats retain an odor. 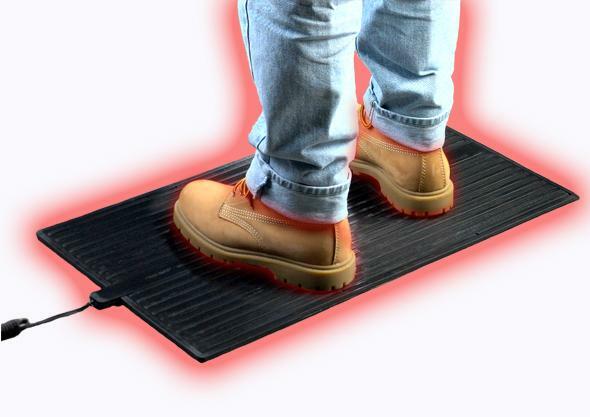 We generally recommend that the FootWarmer be used in industrial areas or garages. Note: Never place any object that has a low melting point (like plastic containers) or covering (like a rug) on top of the FootWarmer because the heat will build. Same as above, but larger. FootWarmer rubber heating mat to the rescue. 10 lbs. Size: 36" x 16" x 0.25" 135 Watts, 1.2 amp, Approximate surface temperature 135 degrees F. ETL Listed. 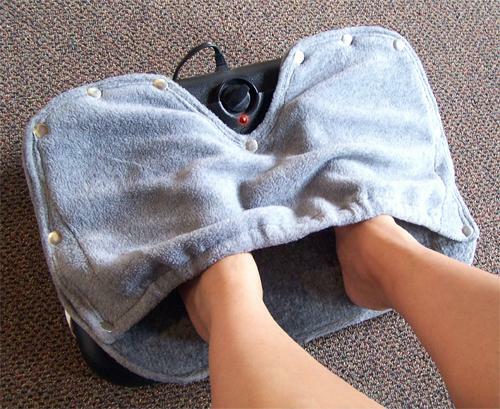 It is recommended that the Cozy FootWarmers, Cozy Toes and Cozy Legs be used with the Hi-Lo Switch to provide a lower setting and a way to turn the FootWarmers off without unplugging. We have lowered our prices no longer include this switch with the Cozy Legs product and Cozy Toes product. Add the comforts of softness and warmth to a hard floor with Cozy Toes carpeted heating mat. We recommend the optional Hi-Lo-Off switch.5 lbs. Size: 18" x 19.5" x 0.5" 50 Watts, 0.5 amps, Approximate surface temperature 110 degrees F. UL listed UL2021, 593311001, E125168. Three convenient positions: Flat, Footrest, or Panel. Easy to set-up and use anywhere. Elegant black-on-black embossed design. 5 lbs (7 lbs to ship). Size 12" x 18" x (maximum) 5" 90 watts, 0.8 amps ETL Listed. Buy Toasty Toes in a 6-Pack and Save. 34 lbs (36 lbs to ship). Toasty Toes foot cover and foot blanket keeps your feet even warmer and more comfortable than ever. The added comfort from the soft fleece in combination with the radiant heat of a Toasty Toes heated footrest provide a comprehensive personal heating solution. 2 lbs (4 lbs to ship). 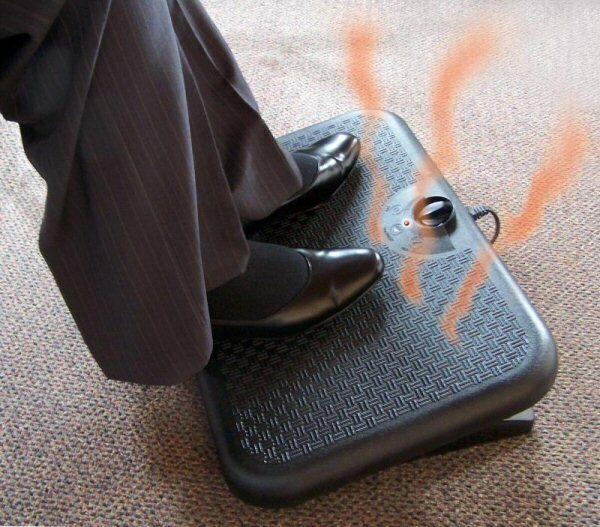 Ergonomic Footrests Heated and not! ** Same Day Shipping: If the order is placed by 9am Central time, and the product is in stock (products are in stock 95% of the time), Overnight orders will be shipped the same day. Other types of shipping will ship the next work day. We cannot control our vendors, but if the order is shipped from the manufacture, it usually ships the two days after the order is placed. Some products (some keyboards) are assembled on an as needed basis and require a few days to assemble and test before shipping.